Very pretty! This image is a composite of five separate images taken with two cameras (PACS and SPIRE), which together cover a wavelength range of light of 70 out to 500 microns — and, bearing in mind the reddest wavelength the human eye can see is about 0.8 microns, you can see that this is way, way out in the infrared. What you’re seeing here are cold dust clouds in the constellation of Crux, the Southern Cross. It was thought these regions would be fairly smooth on these scales, but Herschel is revealing that in fact they’re pretty turbulent. 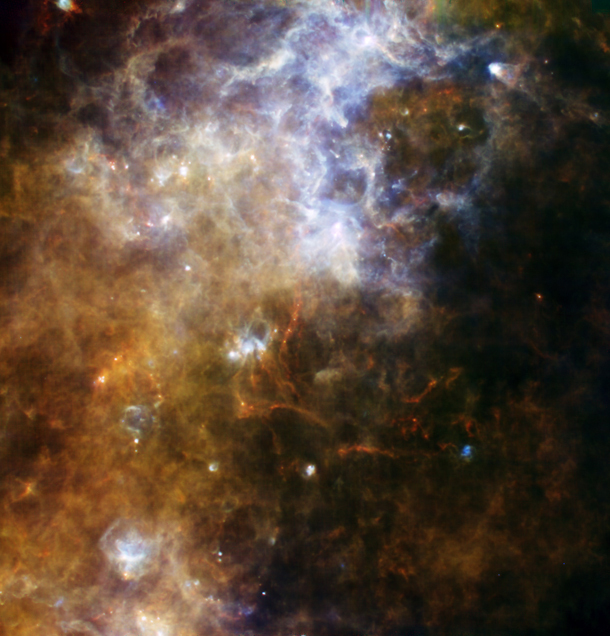 You can see ribbons and filaments of material here, caused by stars forming deep in these dense clouds. You can the odd proplyd or two; small (well, much bigger than our solar system but small-looking here) disks of matter, very dense clouds with stars forming in their cores. Proplyd is short for protoplanetary disks, because these structures are in the process of forming solar systems much like ours. And you can also see long fingers of material; towers of matter where newly-born stars are eroding and blowing away the dust with their stellar winds. In a sense, these are like cosmic sandbars, material being sculpted by fluids flowing past them. Star formation can take place in such thickly-choked regions, but visible light cannot penetrate them; even to Hubble this would be dark material and we could only see the very surface of these clouds. But Herschel sees the kind of infrared light that passes right through the dust, so astronomers can look into the hearts of these areas and learn about star formation. We know quite a bit already, but there are still gaps in our knowledge because these clouds are so thick and difficult to study. With Herschel now on the prowl, we can expect to find out a lot about how stars are born… and also to see more pretty images like this one.